Ragging is an offence in any form and is totally prohibited in and outside the campus of SDIMT, This rule applies to the campus and outside the institute’s premises too. We want to ensure and are committed to create a "ragging free" institution, thus ensuring a serene atmosphere conducive to learning and growth. We are committed to follow all regulations and guidelines formulated by the AICTE and UBTER with regard to a “ragging free atmosphere” for the young students to develop as good citizens. 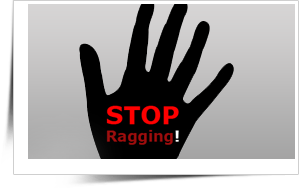 The institute will follow the UGC Regulations on curbing the menace of ragging in Higher Educational Institutions, 2009 (F.1-16 / 2007(CPP-II) dated 17th June, 2009) and take stringent action against those found guilty of ragging and / or abetting ragging, actively or passively, or being part of a conspiracy to promote ragging, in accordance with these and other Regulations in force. Suspension from attending classes and / or academic privileges. Debarring from representing the institution in any regional, national or international meet, events, tournament, youth festival, etc. Expulsion from the institution and consequent debarring from admission to any other institution for a specified period. Where the persons committing or abetting the act of ragging are not identified, the institute will resort to collective punishment.